Garcinia Cambogia: The Fastest Fat-Buster or Another Fad Diet? 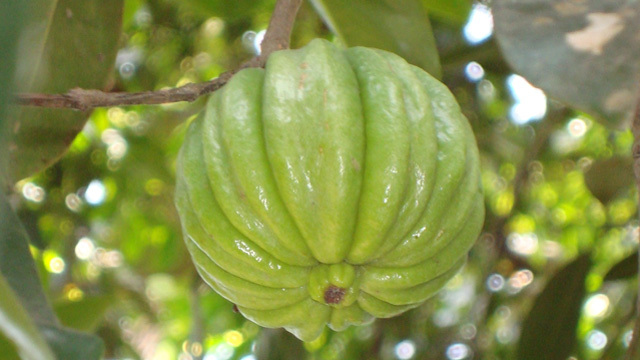 Garcinia cambogia fruit, photograph courtesy of Vssun via Wikimedia Commons. The holiday season is rich with traditions, and many of these involving eating. Most of us indulge in more snacks, finger foods, desserts, alcohol and large holiday meals from Thanksgiving through the New Year. The resulting weight gain frequently leads to another tradition: a New Year’s resolution to diet. There are many popular diets such as the Atkins, South Beach, Weight Watchers, Jenny Craig and Slim-Fast diets. But the latest buzz is about a weight-loss supplement called Garcinia cambogia. On the Dr. Oz television show, Garcinia cambogia was called the ”newest, fastest fat-buster” and a “magic ingredient that lets you lose weight without diet or exercise.” It sounds like the perfect solution for all that holiday over-eating, especially since celebrities like Britney Spears and Kim Kardashian lost significant body fat using it. Are Garcinia cambogia supplements really the weight-loss “holy grail” that Dr. Oz claims? What is it? Is it safe and effective? Garcinia cambogia is a small, pumpkin-shaped fruit that comes from parts of Asia, India, Africa and the Polynesian islands. Also known as Malabar tamarind, the fruit pulp and rind have been used for centuries for culinary and therapeutic purposes. For instance, it’s frequently used in chutneys and curries. Since Garcinia cambogia has been ingested for centuries without reports of adverse side effects, it appears to be safe for most people when taken at normal doses. This is supported by scientific studies that showed no difference in side effects between people treated with Garcinia cambogia and those treated with a placebo. The most common side effects included headaches, upper respiratory tract symptoms, and gastrointestinal symptoms. However, it’s not recommended for some people such as diabetics and women who are pregnant. In terms of weight loss, the active ingredient in Garcinia cambogia extract is hydroxycitric acid (HCA). Some scientists have suggested that HCA causes weight loss by blocking the enzyme that converts sugar into fat, allowing your body to turn sugar into energy instead, so you build more muscle mass and less fat. HCA is also reported to increase the release of serotonin in your brain, which can improve your mood, promote sleep and provide a satiated feeling from food. There is also some evidence that HCA reduces low-density lipoprotein (“bad”) cholesterol and triglycerides, while increasing high-density lipoprotein (“good”) cholesterol. Currently, most studies in humans have been conducted on small groups over short periods (12 weeks maximum), so more extensive research is needed to determine its long-term effectiveness and safety. Meanwhile, you probably want to skip the second piece of pie, or take an after dinner walk to burn off some of those extra holiday calories. And doctors still recommend a healthy lifestyle, including eating nutritious meals and exercising regularly.